It was nice to get out climbing again. 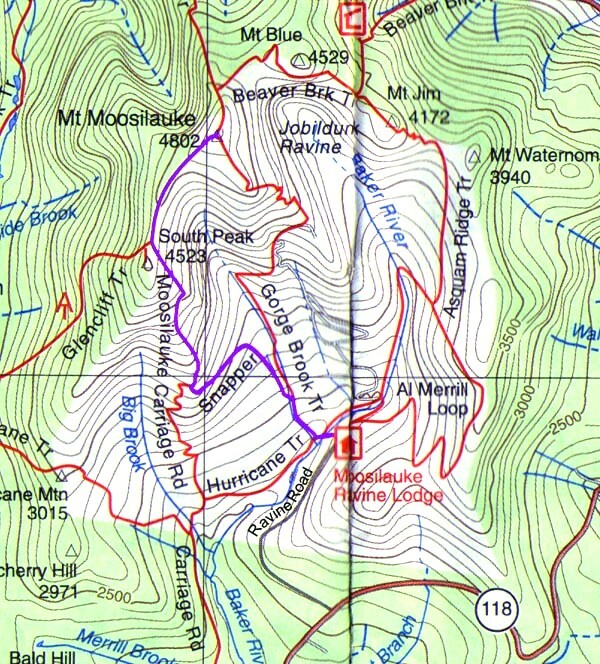 Our previous October hike up Jefferson, Adams, and Madison was just a couple of days before a storm dumped several feet of snow on the White Mountains. Between that and some subsequent bad weather, it wasn't until late November that we could get out again. 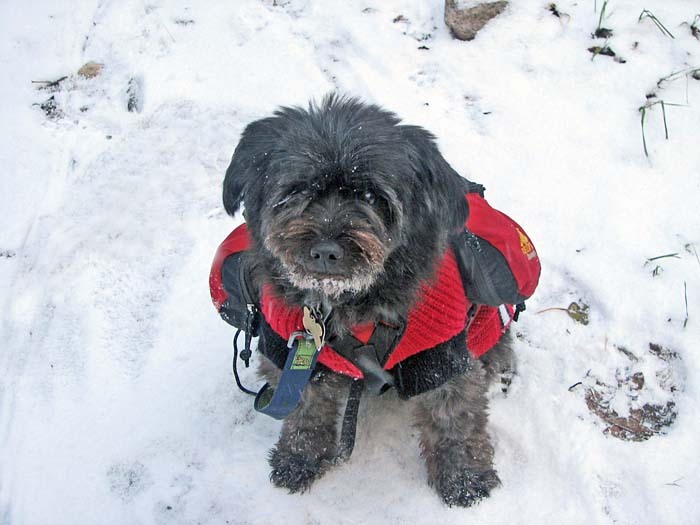 Muffin had only three more peaks to finish her 4000-footers, and I was hoping to finish them by the end of the year. This would be number 46. As usual, we left early and drove north to the White Mountains. Not long before reaching Plymouth, we encountered some early morning snow squalls which made driving slippery and dangerous. Never-the-less, we made it in one piece to Moosilauke Ravine Lodge just a little later than planned. 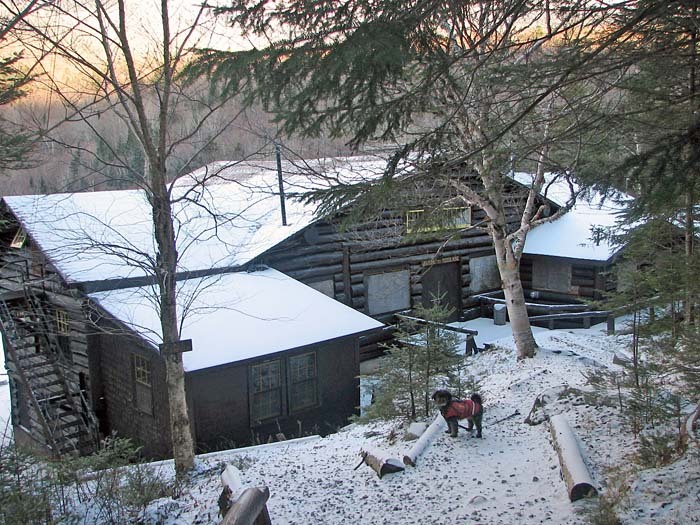 Ravine Road was open with only a dusting of snow and we parked right in front of the now closed-for-the-season lodge. The Gorge Brook Trail officially begins at the turnaround at the end of Ravine Road, heading downhill and circling in back of the lodge on the other side of the Baker River, but we just cut across the lodge's rear lawn and crossed a bridge to meet up with the trail. We soon reached the junction where the Hurricane Trail diverges left, and almost followed it because I wasn't paying enough attention. The Gorge Brook Trail bears right and begins to follow the brook moderately uphill. After crossing a second bridge over the brook, the Gorge Brook Trail turns right, but we continued straight ahead on the Snapper Trail as we were planning on taking the Moosilauke Carriage Road to the top, and then coming back the same way. 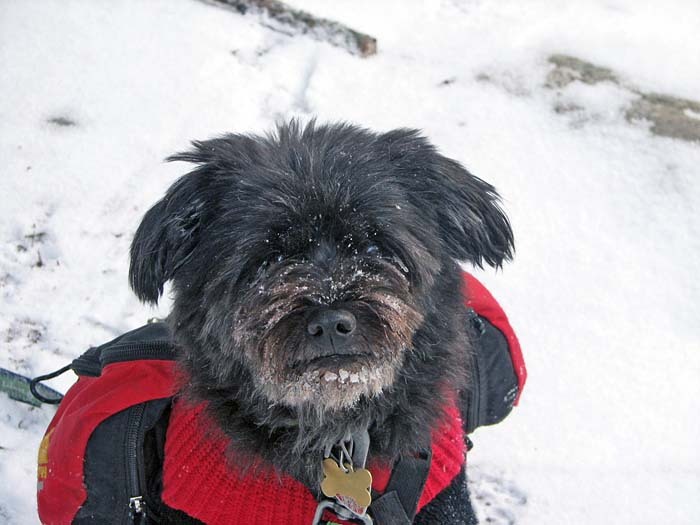 When I stopped for a short rest and a drink of water, Muffin was up to her usual tricks of rubbing her face in the snow, coming up with a white frosty beard. She doesn't seem to mind the lumps of ice stuck to her face, and must get most of her water intake this way, as she hardly ever drinks any water that I offer her on winter hikes. This particular route of the Snapper Trail is only a few years old, and is still pretty rough, rocky, and rooty. Since there wasn't enough snow to fill up the space between the rocks, I had to choose my steps carefully. In a short time, we reached the junction with the Moosilauke Carriage Road, and turned right to follow this wide trail to the summit. I soon noticed that there was more than a mere dusting of snow on the ground as we got higher, but it still wasn't all that much. The clouds were clearing too, and the views to the distant peaks to the southeast were good, though restricted. Muffin in front of Moosilauke Ravine Lodge. 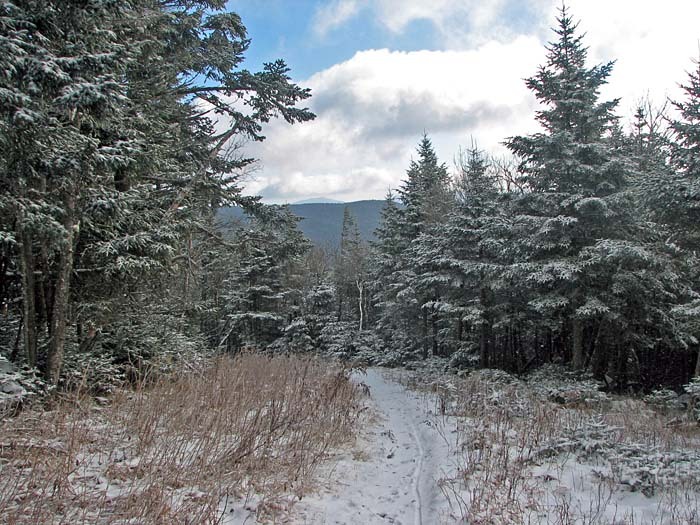 The lodge and most of the surrounding land is owned by the Dartmouth (College) Outing Club, which also maintains the trails. Muffin near the beginning of the Gorge Brook Trail. As usual, Muffin was in a hurry to get moving, and couldn't understand why we were stopping. Bridge over Gorge Brook. 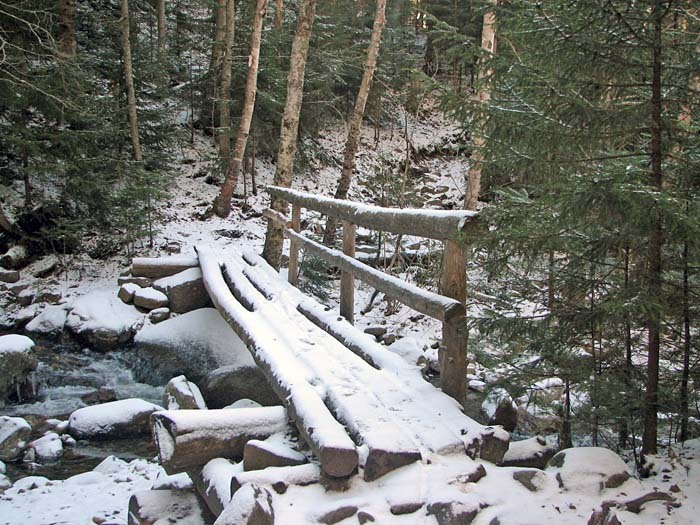 The uneven surface of this small bridge was a bit slippery from the fresh snow. Snapper Trail junction. 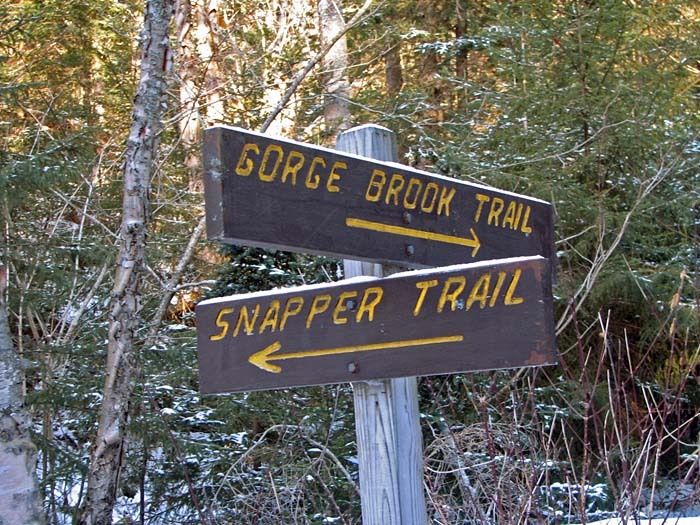 After crossing over the bridge, the Snapper Trail continues straight ahead while the Gorge Brook Trail turns right to follow the brook uphill. Snowy-beard Muffin. She likes to rub her face in the snow and doesn't seem to mind the ice and frost stuck to her face. Carriage Road junction. 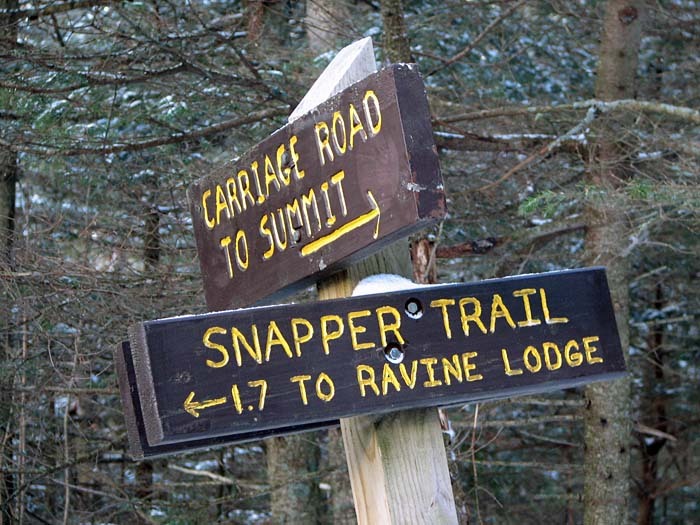 The short Snapper Trail ends here at the Moosilauke Carriage Road. Looking southeast down the Moosilauke Carriage Road toward some distant peaks.